Analyzing humor is like dissecting a frog. Few people are interested and the frog dies. The problem with the above quote is that comedians are leaving the defining of comedy to academics. Academics often have a narrow sense of humour. It’s kind of like having someone who has never been near a child, but has a PhD in education, tell a teacher how to manage a room full of seven year olds. From secondhand knowledge they might have one or two useful ideas, but really they are more likely to stir up kidageddon. What we want are people within our own field defining and redefining comedy. And not leaving it to others alone. We need people who take the time to be self-reflective and have something useful to offer to our next generation of comedians. Their answers may be different, they may even conflict, but they should be grist for the mill. What is comedy and what makes something funny are in fact two different things. The one is about the material, the other is about the delivery. You could be reading from a book of jokes, but if you don’t know how to communicate those jokes in a funny way…no laughs. So understand that a good definition of comedy will help you to create the seed of humour, but you will have to develop an extra set of skills for performance. Comedy is a humorous deviation from the normal and ordinary in human affairs into the abnormal and extraordinary, provided the consequences of this deviation are ultimately minor. To understand how this works I have a graph in pretty colours. 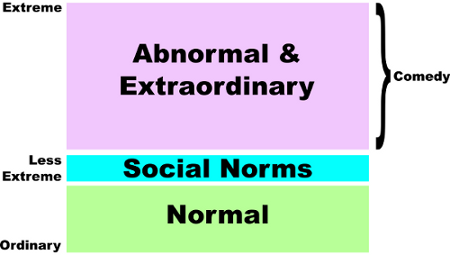 We mostly live within the range of normal and ordinary. This is the baseline for everything else in comedy. In fact many normal experiences pass without conscious note. So upon occasion when someone notices certain normal experiences, those experiences may feel abnormal. In fact it’s our awareness of them and willingness to speak of them that’s extraordinary and becomes a point of comedy. People don’t commonly speak about poop, it’s mundane and socially taboo, so doing so in detail can be funny. Normal also becomes funny when someone’s perception of it is abnormal. Accidentally spilling spaghetti sauce on a new shirt is rather every day. Someone seeing it as a major disaster, because it might ruin their chances with a potential partner, is comedy. I probably should have illustrated social norms as a much finer line, but then I would have no room for the words “social norms”. This is aspirational normality: everyone is thin, young, has pects, owns two cars, has a two storey house, 2.5 children, is straight, goes to church, and votes “more for me, less for them”. If they could achieve the social norm, people feel they could achieve social safety, acceptance, and happiness. The fact of the matter is, hardly anyone ever feels like they have achieved or can achieve this norm. This is from where the marketing bonanza blossoms. Marketers love creating unattainable social norms in order to play on your insecurity and sell you bogus solutions. The only way out of this commercial nightmare is to learn how to accept yourself and accept the diversity of others. Comedy plays a lot with the divergence between actual normality and social norms. The two main types of comedy found here deal either with extraordinary attempts to reconcile normal with social norms or the deliberate transgression of social norms. The TV show Miranda deals with an extraordinary woman who is unusually tall, owns a shop, and sells joke paraphernalia. None of these are bad things, but they put the character of Miranda squarely outside social norms. Her best friend Stevie, who manages the shop, represents the things Miranda feels she would like to be: pretty, petite, competent, and attractive to men. Her attempts at correcting her perceived flaws fuels much of the comedy. George Carlin’s “Seven Dirty Words” routine makes explicit the absurdity of fearing and legislating against certain language. His actual use of those words transgresses against the social norm of using only “polite” expressions. Carlin is transgressing in order to change this social norm toward one more respectful of genuine free speech. Others have used blue material in order to express rage and to assert belonging to a particular class or group of people. The social norm as represented by the media is staunchly upper middle class. Liberally using the Anglo Saxon instead of Norman words such as “defecation” and “copulation” can mark someone as part of the conquered and working classes. Material playing with social norms exaggerates those norms in order to make clear what’s problematic. Most comedy grounds itself in the normal and social norms as a sort of trampoline from which it leaps into the extraordinary. But this is not entirely necessary. The Young Ones, Mighty Boosh, and most animated features start within an absurd and surreal world that looks back at mundanity as the unusual state. We find it funny when an abnormal creature such as a dragon sits up and takes a spot of tea with milk and sugar. Being a dragon isn’t funny, drinking tea is. The abnormal and extraordinary goes from something as simple as misspelling words on a cake to popping popcorn using the laser from a military aircraft. The extremity of the abnormality does not in fact make the comedy funnier, just different. Levels of exaggeration simply indicate varying types of comedy. Mrs Doubtfire has only one point of absurdity, and that’s Robin Williams dressing up as an older woman. In Shrek the whole world is absurd. One of the endearing things about the original Star Wars film was its subtle sense of humour. Though, Hollywood “experts” on comedy will push you to go for the big yucks. I have seen such definitions as “comedy is truth and pain” floating about. This makes comedy sound profound and macho, which is appealing to some people’s egos, but it doesn’t help when you are sitting in front of your computer trying to write material. Comedy is not truth. Sadly, it has been used too often to reinforce toxic social norms and humiliate the vulnerable in our society. However, comedy can effectively be used to communicate truth and get people to listen. Comedy is not pain, it only feels that way when you’re struggling with writer’s block. However, comedy can alleviate pain by lighting up an otherwise dark day. I hope you find my definition a good functional basis for understanding and developing your own comedy. Perhaps in a later post I will find a funny way to put it. In the meantime live, learn, and laugh.